Very informative, great to meet Dr Schwart - Made me at ease about my problem. P.S Dr. is so young! Iwas impressed!! I feel extremely confident that I am in the best of hands. I am always treated with the utmost respect andprofessionalism. I am grateful to be with this practice. I feel extremely confident that I am in the best of hands. I am always treated with the utmost respect and professionalism. I am grateful to be with this practice. A cardiologist practicing at the Keck Medicine of USC, Dr. Jacqueline Schwartz takes care of the local population in Los Angeles, CA. She completed her medical training at Albany Medical College. She subsequently completed an internship in family medicine, a residency in internal medicine, and a fellowship in cardiac electrophysiology at Kaiser Permanente Medical Center. Dr. Schwartz is certified in cardiovascular disease and clinical cardiac electrophysiology by the American Board of Internal Medicine. 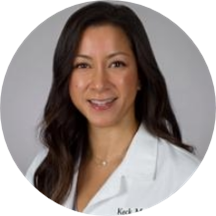 She is affiliated with the Keck Hospital of USC and USC Norris Cancer Hospital. She is a kind professional who encourages patients to freely discuss their problems. She approaches patient care with compassion and positivity. Dr. Schwartz keeps herself updated on recent research and advances to ensure she can offer the best treatment to her patients. She actively engages in educating the patients about their health and believes that knowledge empowers patients to make better decisions regarding their care.